Are you in dire need of a complete air compressor package? 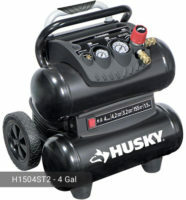 Husky 80 Gallon 2-Stage Cast-Iron Electric Air Compressor is more than enough. It has a very powerful motor with a 7.5 horsepower output. This level of power is usually used for industrial purposes and heavy-duty tasks. 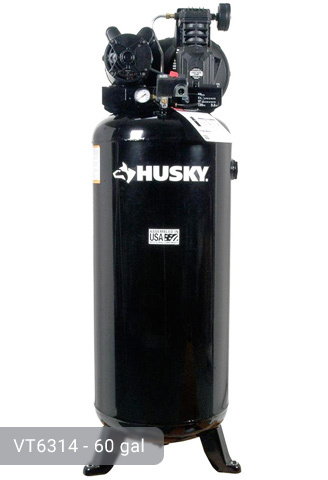 This Husky 80 gallon air compressor also has a factory installed magnetic starter to simplify electrical hook up. Since the power output is more than 2 HP, it requires a 240-volt electrical power outlet to run. The maximum pressure is at 175 psi. This level of pressure can perform tasks that other models cannot such as grinding and surface preparations. Aside from these, lighter tasks such as air brushing, blow nailing, and inflating can be quickly accomplished. Husky TF2912 model can deliver 23.7 SCFM of air at 90 psi. Not all brands have a model that can deliver air at this level so consider yourself luck with Husky. The pump is oil-lubricated which is ideal for industrial grade motors such as the one that this air compressor has. Because it is lubricated with oil, it has to be maintained regularly and properly. The pump is very durable because it is made of solid-cast iron. The intake filter is Solberg-styled so maximum efficiency is guaranteed. This filter increases the horsepower to the desired level. 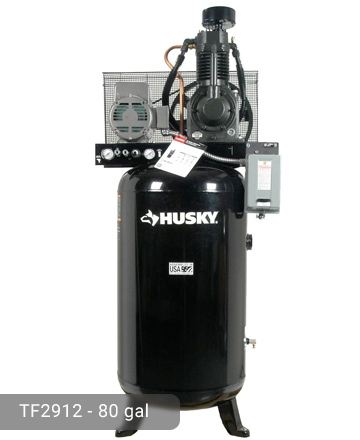 Certain features complete the high-quality performance of this Husky 80 gal air compressor. These include a control panel with tank and outlet gauges, two couplers, and a pressure switch. All of these provide convenience in controlling the pressure level and powering your pneumatic tools. The tank has a huge capacity (80 gal) which allows it to receive high levels of pressure without burning. It is made of steel and is ASME certified so it is proven and tested to be safe. The air pressure that the tank receives is of high-quality because it undergoes two stages of compression. This 2-stage process greatly contributes to the strong performance of the machine. It can run all day long with only a few minutes of rest period. The tank comes in black but the consumer can prefer to choose other colors. Because of its massive size and huge tank capacity, it is not portable. However, its vertical size still saves space in your garage or work area. It weighs 540 lbs. so it is better to place it in a permanent spot. It is also a bit noisy with a decibel rating of 87 dBa. Considering its size and power, the loud sounds should already be expected. 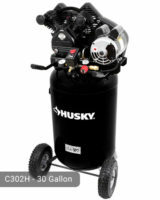 Husky 80 gallon air compressor TF2912 is mostly used by industrial companies who perform heavy-duty tasks daily. If you will not be doing such, you might prefer other models because they are portable However, if you want something that can perform both, this model is recommended. It may seem costly ($ 1,999.00 in Home Depot) but if you study the specifications of this machine, you will understand why the price was placed that way. Try it now! If you already own Husky TF2912 model or just want to buy it, feel free to share your review or ask a question through the form below. I own a Husky Air Compressor Model TF2912 that needs servicing. It keeps tripping the breaker when it is placed in the on position. 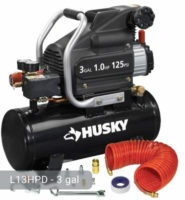 Can you supply me with a Company that services Husky Air Compressors. I have had absolutely no success in finding one in my Area. I live in Monroe Georgia & my zip code is 30655. It is much to large to carry it to someone for repairs. Really need help…..